Thanks for Visiting Our Site!!! 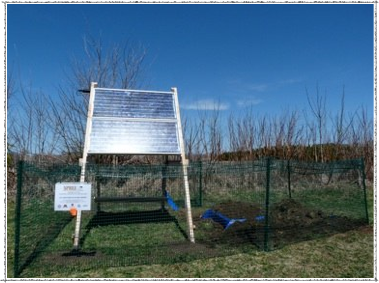 Funded by the Earthscope Program of the National Science Foundation, geoscientists from American and Canadian universities installed 82 seismometers in Minnesota, Wisconsin, and Ontario for their project: SPREE (Superior Province Rifting EarthScope Experiment). These seismometers recorded earthquakes from all over the world. Geoscientists use seismic waves from these earthquakes to produce images of the Earth’s interior structure. NEW: "Nuggets" of SPREE-data driven research are available for browsing under the Research tab in the top menu and were submitted to the Earthscope National Office in Alaska in 2017-2018. Though funds ran out in 2015, we are still continuing to use SPREE data and findings to research this fascinating part of North America. Why install the seismometers in the middle of a continent, where earthquakes are rare? We want to study a somewhat linear geologic feature called the Midcontinent Rift. About a billion years ago, this part of the continent started to break apart, or "rift". Over about 20 million years, an enormous amount of volcanic rock erupted. In total, the Midcontinent Rift contains about a million cubic kilometers of volcanic rock—enough to fill up all of the Great Lakes twenty times, and enough for an ocean floor twice the area of Lake Superior. Earth's oceans started as such rifts. For example, the Americas rifted apart from Europe and Africa to form the Atlantic Ocean. Despite its voluminous efforts, the Midcontinent Rift failed to break North America apart. SPREE seismic stations remained in place for about two and a half years. Sixteen stations in Ontario are placed north of Lake Superior. In Minnesota and Wisconsin, two lines of stations cross the rift and one line follows the rift for a total of 66 stations. Each station was placed in an area far from sources of noise and vibration such as roads, railroads, and occupied buildings. The seismometers themselves were buried underground, and all of the electronics were powered by solar panels. Twice a year, four field managers visited the stations with field assistants, to collect the data recorded by the seismometers and check to make sure the stations were functioning properly. This project was funded by the National Science Foundation (www.nsf.gov) through EarthScope (www.earthscope.org) and is enabled by the dozens of landowners and park rangers that allow and assist us with installing and running these stations on their land. Thank you so much!! For a description of people involved in SPREE click on People in the top menu and for a list of universities and other institutions involved, click on Friends of SPREE in the top menu.